The cow project, introduced in 2013 by IIMC director Dr S.K. Brahmachary, is very popular with UK sponsors and donors. The cow is sacred and much revered in Indian society. She is a symbol of abundance, of the sanctity of all life and of the earth that gives much while asking nothing in return. Owning a cow is far beyond the means of the poorest. For this project, a cow is given to a woman who is either involved in one of IIMC’s initiatives like the Peace Council or from a rural village, to help generate a regular income by selling it’s milk. 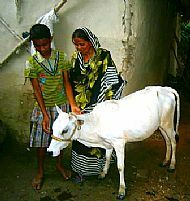 The woman and her family will own the cow and will be able to earn money from the sale of it's milk. The cow’s first calf, however, has to be surrendered to IIMC who will then give this calf to another woman living in a remote, rural area.This new calf is expected to calve after 1½ to 2 years. When it has given birth, it’s new calf is again returned to IIMC to be given to another woman. And the process goes on. The number of cows available in the scheme will multiply as the project progresses. Through this scheme IIMC hopes to reach and economically empower as many poor families as possible. To start off the project IIMC bought their first cows from ‘cow-selling’ markets. Sponsors and donors wishing to support the project gave 80 Euros for each cow. Our Coordinator had the opportunity to witness the purchase (from a market), delivery (by boat) and presentation of a cow to a woman who lives on an island deep into the rural regions of West Bengal. The place is only accessible by boat.